We have confirmed the date for Saturday, February 27, 2010 at 6:00PM. We kindly request your support in this endeavour as you have done in the past. Please advice us if you able to secure any pharmaceutical sponsorship for the event/CME part. Also confirm your attendance early by contacting me or one of the Board members. 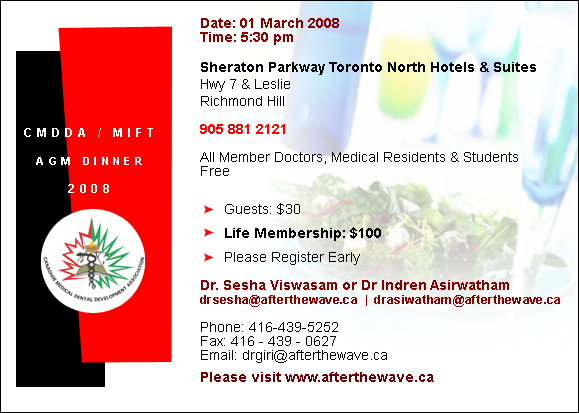 CMDDA/MIFT Members Dinner Gala - Sat. 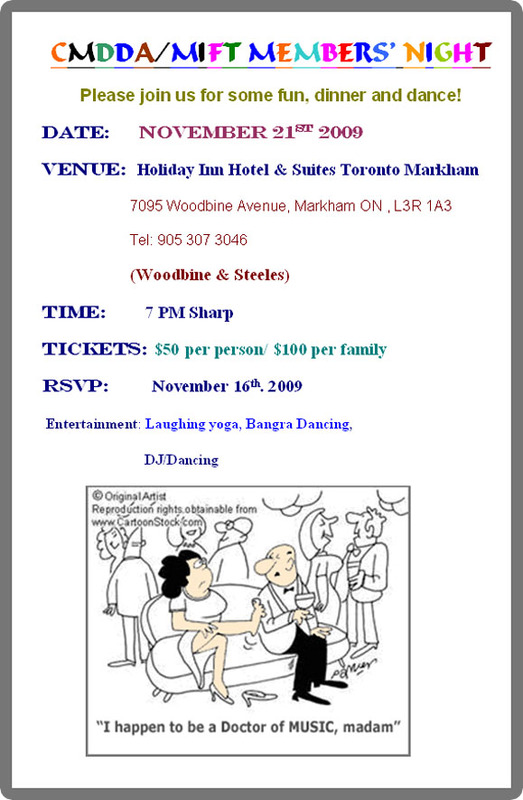 Nov. 21, 2009 @ 7:00 pm. Health Forum on Sunday November 08, 2009 at 2:30 p.m. - 6:00 p.m.
Health Forum is organized by Medical Institute for Tamils covering the following topics: Rescure's CPR, Dental Hygene, Stress, Chronic Disease, Flu/Swine flu, etc. 2:30 p.m. . 6:00 p.m. 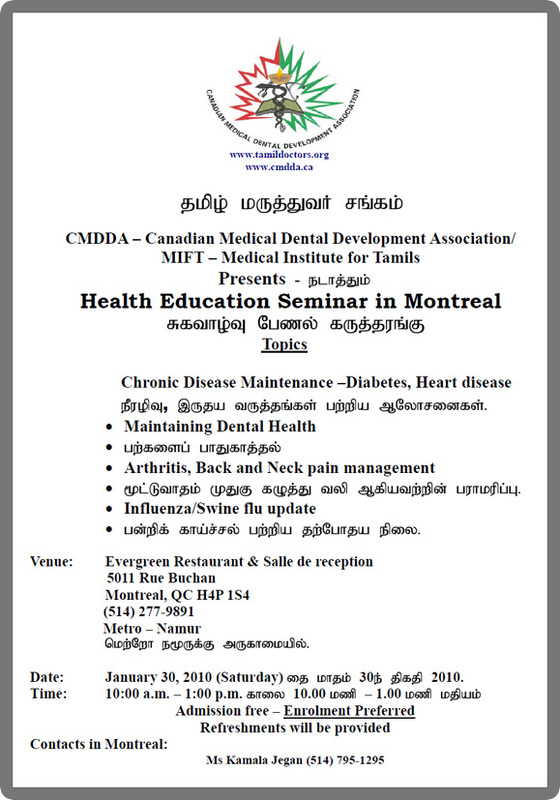 Contact Dr. Rajes Logan - (905) 944-0100 or Dr. Santhakumar - (905) 273-7946 for more information. Click here to print the flyer. Thuyar Nivaaranam is organized by Medical Institute for Tamils in collaboration with other professional groups. This year the AGM / Dinner will be held on SUNDAY 13th of NOVEMBER 2005 at 6.00 pm at the Sheraton Parkway Hotel at High way 7 & Steels [ the same venue where the 'after the wave' dinner was held ]. As we have already organized one grand dinner in April 2005, this will be more like a small family affair with only the members and their spouses. The dinner will cost only $ 50 per head. There won't be a souvenir; any big sponsors or guests except for some invitees from our counterparts form USA-the IMHO members. We are trying to combine a CME (continuing medical education) course at the same time. Please be kind enough to email back and let us know ASAP, whether you will be attending this dinner. It is being organized on a Sunday this year keeping the dentists in mind as most of them are working full day on Saturdays. Join in and enjoy an evening meeting and dining with your friends and colleagues. More Info: Click here to to contact the MIFT committee members. Please don't forget the Tsunami Victims of Sri Lanka! At this critical moment - they need your help! Hope! A new and bright future ! Please join us in making this endeavor a success.